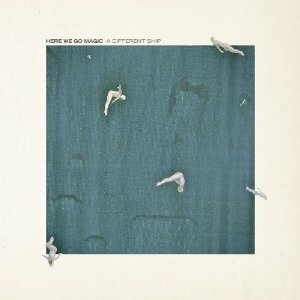 Known for stellar live performances of psychedelic jams, Brooklyn’s Here We Go Magic has released their third LP, A Different Ship on Secretly Canadian. The band experiments with an array of ideas creating tracks seemingly from stream-of-consciousness with electric vibes slipping into each crack between dreamy folk guitars and hazy hooks sung by front man Luke Temple. Recorded with Nigel Godrich of Radiohead, the band’s new album A Different Ship showcases a focused yet relaxed Here We Go Magic who has consolidated their various visions into a succinct sound and their most poignant release yet. A clamorous mess of horns and whistles reminiscent of a busy boat dock opens A Different Ship and signals the start of a journey. Not only has the production of Here We Go Magic matured, but Temple’s song writing has also developed, as A Different Ship is a vibrant voyage through a range of soothing tunes about the delicate nature of relationships. A hushed Temple pleads to a lover on the lead single “Make Up Your Mind,” a song of spaced out solos that ratchets up the energy of the record. But the brief turbulence ends with “Alone But Moving,” a tranquil track that carries a calmness throughout the release and displays the polished sound of Here We Go Magic. With a cheerful chorus and joyful chanting, the lead single “How Do I Know” will surely be a hit live as Here We Go Magic jams out with a newfound steadiness and comfort. Here We Go Magic has discovered a sublime level of relaxation as a band on A Different Ship. The group with a taste for the psychedelic remains the same, but their new direction serves for smooth sailing.